Imagine to yourself, for just a minute, that you’ve double-crossed the Mafia. Suicide, right? A guaranteed one-way ticket to sleeping with the fishes. Worse, you did it out in the open, testifying against the mobsters, and ratting them out to the government. Now, how long do you think you’d last before you felt the unfamiliar weight of cold steel pressed against your skull? 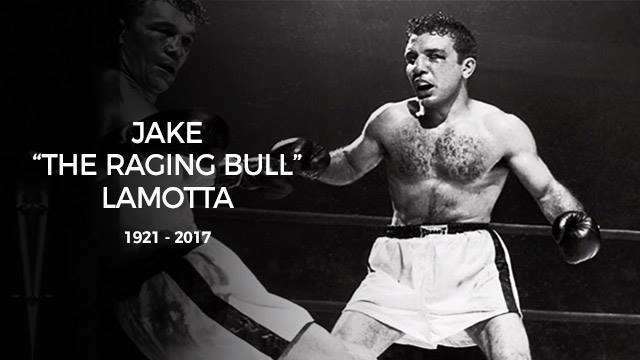 That story might sound like a deleted scene from The Sopranos, but it actually happened to one Giancobbe LaMotta, better known to the world as Jake or the “Raging Bull,” who passed away last September 19 at the age of 95. For those of you too young to remember, LaMotta was the former middleweight boxing champion of the world. He was the Canelo and Golovkin of his day, except he had a distinct New York accent. During his heyday in the ‘40s and ‘50s, boxing was controlled by organized crime. Unless you kissed the ring, you stood little chance of making the big-time. LaMotta was no exception. He was a good fighter en route to becoming a great one, but the powers-that-be refused to grant him a title fight. Desperate, he agreed to throw a fight in exchange for a guaranteed shot at gold. He later admitted to his crime, and spoke up against the gangsters in front of a U.S. Senate sub-committee. The fact that he avoided and survived any possible reprisals is nothing short of a minor miracle. But lasting to old age isn’t his only impressive feat of survival. Throughout his career, LaMotta displayed an inhuman knack for absorbing punishment without flinching. In over 100 fights, he was battered with punches by some of the greatest middleweights ever; punches that would’ve annihilated lesser fighters, yet he was only ever knocked off his feet once. If you watch his interviews in the ‘80s, he speaks coherently 30 years after leaving the ring. Think Golovkin’s knockout blows are hard? LaMotta took those kinds of punches for breakfast. LaMotta fought some of the best names in middleweight boxing history: Fritzie Zivic, Marcel Cerdan, and Bob Satterfield are just some of the big names on his resume. His greatest foe was Walker Smith Jr., aka Sugar Ray Robinson, another legendary boxer that 20- and 30-somethings today might not be familiar with. Long before Floyd Mayweather and Roy Jones Jr., hell even before Muhammad Ali, Robinson was the epitome of the slick and graceful sweet scientist. He’s widely considered by experts to be the greatest pound-for-pound boxer in history. Sorry, Pacquiao die-hards. The first man to beat Robinson? You guessed it. The first of their six fights took place in 1942 at Madison Square Garden, where Robinson won via decision. The rematch took place the following year. Robinson was the favorite going in, but LaMotta wouldn’t be denied. He knocked Robinson through the ropes in the eighth round, and eventually won a unanimous decision. Don’t think that LaMotta reached his 90s by taking his vitamins and doing yoga, either. LaMotta was still a regular fixture at fights, drink in hand, cigarette dangling from his mouth, and a look that told you he was still a badass. Go on YouTube and you’ll find videos of him shadow boxing in his old age. The man was #YOLO and #lit before you were even born. Rest in peace, champ. Even death took nearly a century before it could knock you out.